Artist rendition of the "rocket chair," designed to lower people and equipment onto the lunar surface. Along with a look at how best tostage Earth/Moon transportation, one novel approach to dispatching people ontothe Moon is the "rocket chair." The rocket chair idea as envisionedby SpaceDev would be modular and dual purpose. 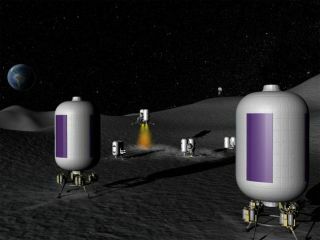 The hardware could land smalllunar observatories or other science gear on the lunar terrain. It could alsolower individuals from lunar orbit onto the Moon. According to a SpaceDev, the rocketchairs have the added feature of carrying sufficient propellant to ascend backto the command module for the return trip to Earth. In fact, on the way to theMoon -- should a problem develop -- rocket chairs, attached to the outboundcapsule -- have enough fuel to return the capsule to Earth for a directatmospheric reentry. "If we are correct about ourlunar mission cost estimates, our type of human mission could have forty peoplevisiting the Moon for the cost of NASA's first mission," Benson concluded.